we get started I want to remind you guys that I am no photo editing expert or pro by any means, this is just what works for me and what you guys seem to be loving from my content. Second, please remember that I do all the work on my own, I don't have a team of people - this is a one woman show... well that's not true my #InstagramHusband is my right hand man and photographer as most of you know. So he actually learned his way through our camera on his own and I do the editing. I do it all on my blog so I try to simplify my life while giving you the best of my abilities and content I can provide, so don't expect a crazy techy or professional post about how I edit my pictures... this is a pretty simple and to the point way I edit. Dave got me this camera years ago, about five to be exact, but we've purchased new lenses for it since then. We have a Nikon 35mm lens as well as a 50mm lens that we shoot with. Eventually I want to get a big and badder camera but trust me when I say you do NOT need a fancy super expensive camera to shoot great pictures. The latest model for the D3100 is the Nikon D3400, you can click on it below for all the details. No matter what the situation we always shoot in the day time when it comes to my content, summer, fall, winter and spring... always natural light or outdoors. Lighting is such a key factor when it comes to photography, but that doesn't mean you want to shoot in direct sunlight either. We always want daylight but in shaded areas, if that makes sense. So I am never standing directly under the sun. We can be outside and I will stand where there is shade, otherwise the photo will come out super washed out. Play around with your camera and you will see what I mean. This is something my husband can answer better than me but I'll try my best. We shoot in manual mode only so we do all the settings manually on the camera. We adjust the ISO and exposure depending on the light we are shooting in; cloudy, sunny, evenings, you get the idea... This is something Dave learned on his own and little by little we played around with the camera and settings and he really learned his way through the camera. If you are starting off and just got your DSLR I recommend looking at YouTube channels and google tutorials. One of the best photographers in Miami Gabriel Sanchez has a YouTube channel with amazing tutorials, check it out HERE. We are no way near this level of photography or equipment! (haha!) but he is amazing and kind enough to share his tips and tricks. Definitely follow him on Instagram and YouTube. So once we shoot the pics I bring them over to my computer and edit. 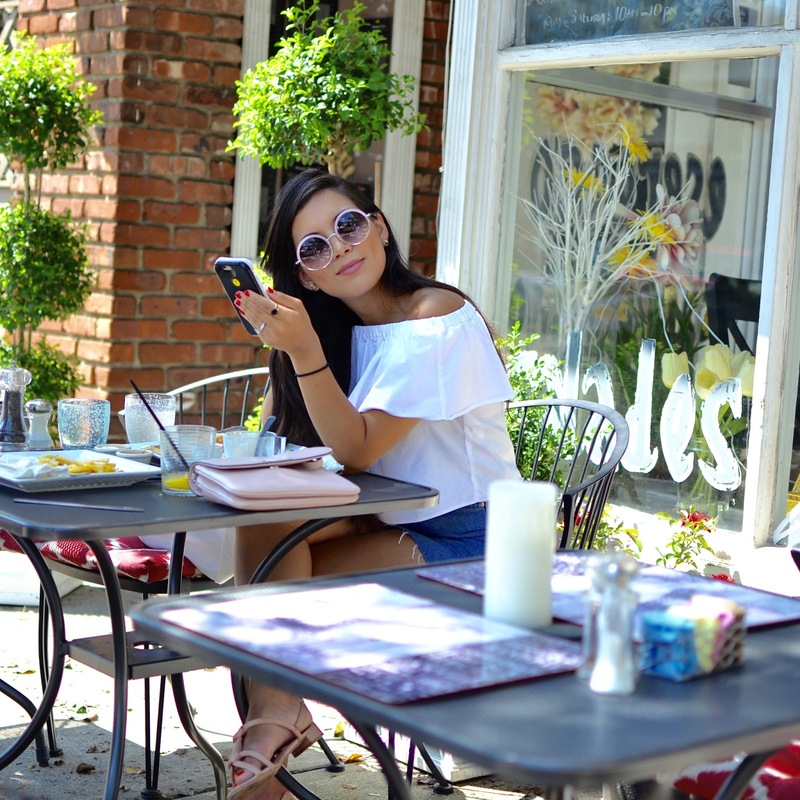 Not sit back and relax but I probably edit the most simplest way possible... no seriously, I've spoke to some blogger friends and believe me I feel like a true rookie... 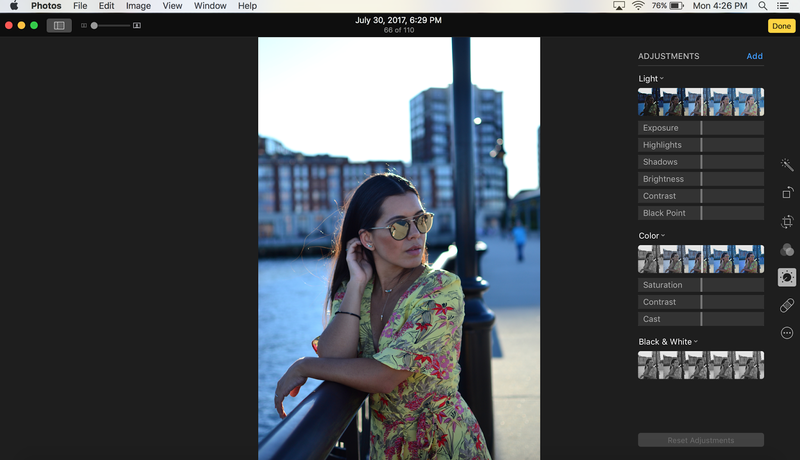 I don't resize, I don't shoot on RAW and I don't use the editor programs they use!! But I need to find the time and do so because they are amazing! One of the photo editor programs I want to learn to use is Lightroom, I've heard amazing things about it... so it's on my goals list... for now, here is who I do it right now. 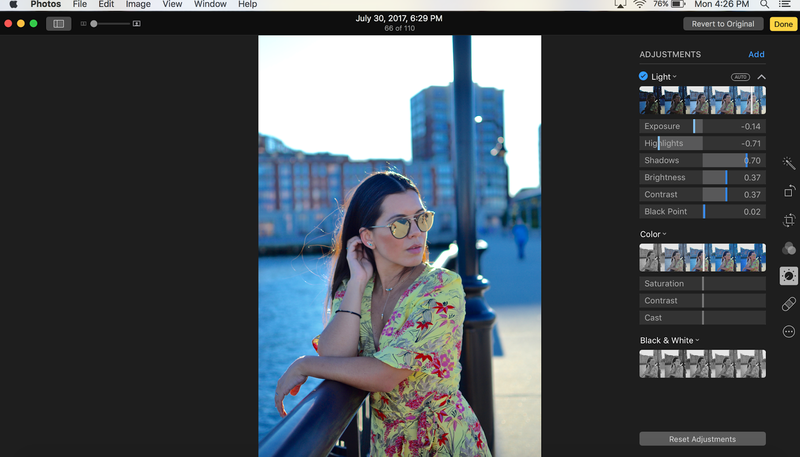 Once I move my pictures over from the SD card, I simply go to the Edit screen under Photos on my mac. It's on the upper right hand side of the screen. On there I play around with brightness and contrast. Most of the time I adjust the light only. You'll see what I mean when you are on the Photo Editor itself. And that's it! [Insert monkey covering his eyes here]. Then I use these barely edited photos for my blog post but I do edited them a bit more for Instagram. Instagram is all about the pretty things and the very visual appealing photos... perfectly curated stories are the way to go on Instagram, after all it's the best and most used social media app to date. People want to see visually gorgeous photos, I try to keep my Instagram feed pretty and my captions REAL. I think that balance works best for me. 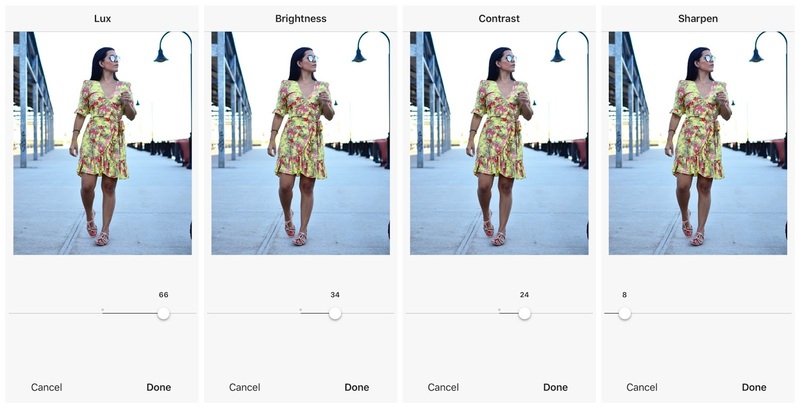 So when it comes to Instagram editing - big surprise! - I also don't go crazy with apps... I credit daylight to all my photos and of course my amazing photographer;) Below are the settings I normally use on my Instagram photos. Sometimes the editing on my computer is enough but other times I do adjust some settings, here they are below. Here is the before and after of the photo. The before has absolutely no edits at all and the second is just edits on the Instagram app alone. You can clearly see that it is a brighter photo, there's some contrast to it and it's sharper than the original. As I mentioned, I don't go crazy with editing, there's so much more than I can do but I like to keep my editing minimal and my photos as real and organic as they can be. I do use FaceTune for whiteness and to clean up anything white that looks too gray or yellow, especially for iPhone photos as well as the lighting or brightness feature on the FaceTune app. That is about the only setting I use on that app and this is the only app I use when I need to. For the photo above, simply adjusting the brightness gave me a white background, so you don't need to go crazy with a thousand apps. I could've perfect the floor and cleaned up the cement... smoothed out my face and legs but honestly I like to be real and it works for me:) aside a big factor is time. I don't have time to edit one picture 5 different ways but what I do works for me and you guys seem to love it and that's what matters. That's pretty much it:) there is not much magic or science to it. I use very simple editing techniques but they work for me and I get a lot of compliments on our photos. I know a lot of bloggers use a few editing apps when it comes to Instagram photos but honestly that's not me. Now when I start hiring people and having time to edit my photos in 4-5 apps then I will, for now, these are my tricks of the trade. I hope this is helpful to you and if I missed anything please comment below with your questions or whatever I missed and I will update this post. Thank you guys so much, I hope this was informative to you and helps you in your own blog and Instagram feed. Have a great first week of August babes! Xo.